The complete first three seasons of the HBO medieval fantasy drama based on the bestselling novel series 'A Song of Ice and Fire' by George R.R. Martin. The programme follows the battle between the Starks and the other noble families of the Seven Kingdoms of Westeros to gain control of the Iron Throne. 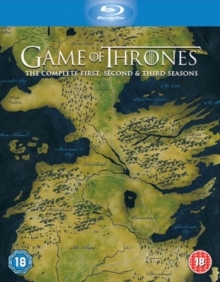 Season 1 episodes are: 'Winter Is Coming', 'The Kingsroad', 'Lord Snow', 'Cripples, Bastards and Broken Things', 'The Wolf and the Lion', 'A Golden Crown', 'You Win Or You Die', 'The Pointy End', 'Baelor' and 'Fire and Blood'. Season 2 episodes are: 'The North Remembers', 'The Night Lands', 'What Is Dead May Never Die', 'Garden of Bones', 'The Ghost of Harrenhal', 'The Old Gods and the New', 'A Man Without Honor', 'The Prince of Winterfell', 'Blackwater' and 'Valar Morghulis'. Season 3 episodes are: 'Valar Dohaeris', 'Dark Wings, Dark Words', 'Walk of Punishment', 'And Now His Watch Is Ended', 'Kissed By Fire', 'The Climb', 'The Bear and the Maiden Fair', 'Second Sons', 'The Rains of Castamere' and 'Mhysa'.